Debriefing Session, a one on one performance action taking place a hotel lobby in central Manchester. The performance adopts the form of a diplomatic engagement between individuals to explore the intricate and often concealed ties between cultural institutions, funding bodies and political agendas. 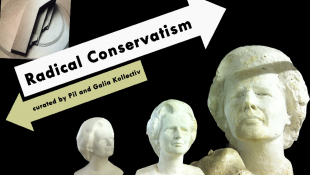 Join Pil and Galia Kollectiv for an informative tour of Radical Conservatism exhibiton at 2pm on Saturday 30 November. Castlefield Gallery is pleased to present Radical Conservatism, curated by Pil and Galia Kollectiv for its Art & Society strand of exhibitions and includes works by Chris Evans (London); IRWIN group, founded in Ljubljana (Slovenia); Joseph Lewis (London); Patrick Moran editor of the metal fazine Buried (London); Oscar Nemon ; Pil and Galia Kollectiv (London) and Public Movement (Israel).